One of the most common requests is for people to change the hands on a weapon. I requested the exact same thing a couple times. Now that I know myself, I’ll shed some light on the situation for all who don’t know. 1. First things first, get Milkshape 3D. The trial won’t late you save stuff, so buy it or get it from a friend. 2. Crucial to the success of this would be having Jed’s Half-Life Model Viewer. Install that. Then, download MDLDEC so you can decompile models. To use MDLDEC, place it in a directory (such as the HLMV installation directory), and, while in HLMV, go to Tools > Configure Tools, and point to the path of MDLDEC.exe. Don’t worry about StudioMDL, we’re going to be compiling with Milkshape. 3. For this tutorial, we’re going to change the hands on this MP5 model. 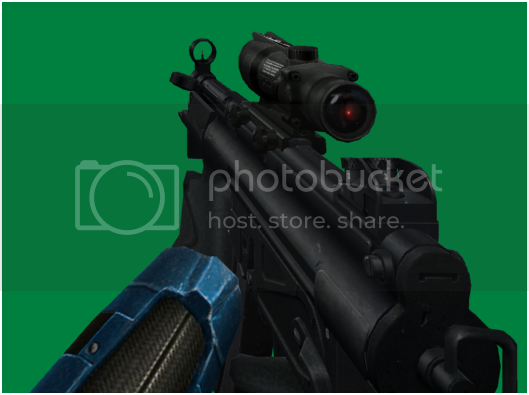 We’ll be converting from Ambient.Impact’s HEV arms to Sven Coop arms. 4. 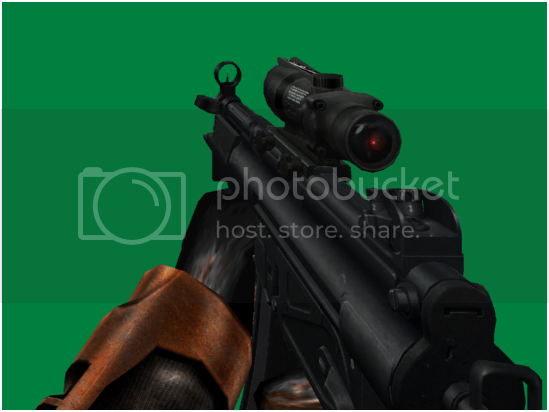 Open the MP5 model on HEV arms in model viewer. Look at the animations, the way the arms move, etc. Get a feel for how the animations look when properly compiled. 5. Copy the v_9mmarHEV.mdl from the folder you viewed it in to a folder on your Desktop or work folder called “MDLDEC.” Now, open the model with HLMV, and go to Tools > Decompile model. In your MDLDEC folder, you will notice there are BMPs, SMDs, and a QC file. The QC file opens with Notepad, so set it up so that they open with it via a double click. a. The BMPs are set up to follow the model’s “UV Map,” that tells what parts of the 2D texture go on specific parts of the 3D model. It’s pretty intricate. We’ll mess with these later. b. SMDs can be references or sequences. Sequences are animations, and references are the different parts of the model. A reference SMD can only have so many vertices (around 2500) for a successful compile. Many “SD” models will have at least two reference SMDs. Sequences are animations. We don’t need to mess with those right now. 6. For this tutorial, we will be converting this from HEV arms to SC arms, so decompile a model from Sven Coop (here the grenade), and copy the arm reference SMD and its textures to your MP5’s MDLDEC folder. 7. Launch Milkshape 3D. Don’t let the screen overwhelm you, you’ll get used to it in no time. Now, you’ll want to import your HEV arm mesh first. Go to File > Import > Half-Life SMD. Navigate to your MDLDEC folder and click v_gordon_hands_ref. Next, a dialog box will come up, asking if you want to import Triangles, Skeleton, and/or Rename Bones. Here, import triangles and skeleton. You should get a screen like the one below. a. The blue lines are called joints, or the skeleton. The skeleton moves and bends in the animations. 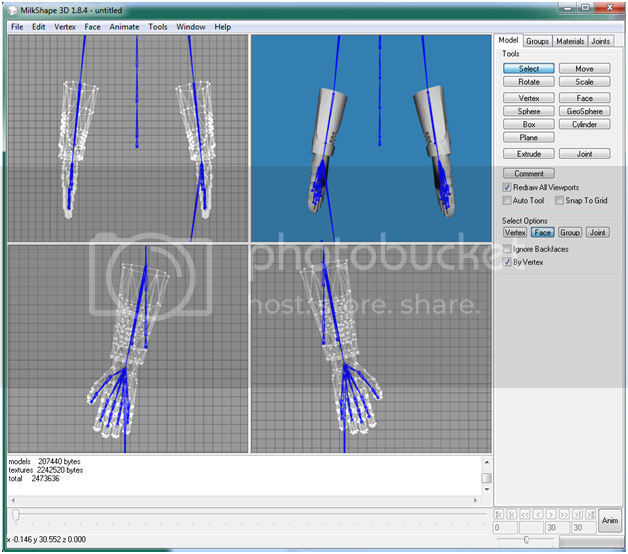 Certain parts of the model are assigned to certain joints to make the animations appear how they do when you see them. b. Also, if you want the screen to look exactly like mine, there are a couple steps you need to take. Right click on one of the four windows and look at the Projections option. I have it set up (starting from top left and going clockwise from there) as: Back, 3D, Left, Right. c. Finally, go to File > Preferences, the Misc tab, set Joint Size to “0.15.” The thinner the joints are, the easier they are to work with, in my experience. 8. Next, import your Sven Coop arm mesh. When the dialog box appears for Import options, set it to import Triangles only. You’ll now notice that the Sven mesh is in the same place as the HEV mesh. Go to the Groups tab, and double click the group “V_Arm_Texture.” Now, go to the Model tab, and click Move so you can get it out of the way of the HEV mesh. a. I moved it out of the way. It’s a good idea to adjust the height of the arms on one side, so that on the left and right projections, when you select vertices, you only select them on one side rather than both. b. Also, in the Joints tab, click “Clear” while you have the Sven Coop arms selected. 9. On the Model tab, click Select, then down below, under Select Options, click Vertex, and uncheck “Ignore Backfaces” if it’s checked. a. Repeat this process for the rest of the bones. When you are satisfied with what you’re done, continue to step 12.
b. Make sure no vertices go unassigned! To make sure everything is assigned to something, click “SelUnAssigned” and pray that no vertices are highlighted. c. After you’re done, save your work as an MS3D file (Ctrl+S). 12. Now that you’ve got your vertices assigned (hopefully correctly), we have a couple more things to do before we export and compile. a. Select the HEV arms, and delete them. 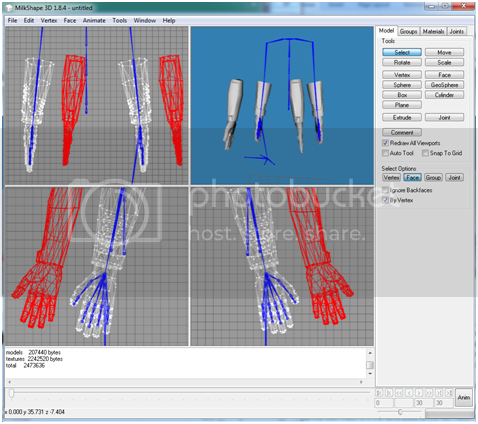 Now, select the Sven arms and move them so that they’re in line with the joints. b. Now, hit Ctrl+A or Select All, and hit Ctrl+T to open the Texture Coordinate Editor. While it’s open, click Move and place the UVs so they fit as closely as possible with the texture(s). When you’re satisfied, go to File > Export > Half-Life SMD. Name it v_sven_hands_ref or something of the like. When the Export Options dialog box comes up, make sure it’s set to Reference. i. Import one of the gun’s reference SMDs and adjust the UVs (They shift one pixel to the left when decompiled). Export. Do this one at a time, to assure a successful compile. c. Open your QC file in the MDLDEC folder. Find the line where it says “$body "studio" "v_gordon_hands_ref"”. Replace v_gordon_hands_ref with v_sven_hands_ref or whatever you named it. Feel free to ask further questions in this thread, especially if you're stuck or need something clarified. Seriously though, 's a good tut to get started on. Yeah whoever hacked this ACOG should, most definitely, be lit on fire. Good basic tutorial for arms that are already posed in position. Might be difficult for newcomers to know which verts to assign, especially tricky bones like the thumb. But trial and error never killed any body (okay, maybe not for modding). Also contingent on how detailed the arm models they use are, too. Nonetheless, this tutorial is very good at outlying the parameters of reconfiguring joint sizes, holding shift, unchecking backfaces tab, etc. A great place to start. I hope it wasn't me but I don't think it was me..
yeah, it's really just teaching the most baaasic rigging. this is like, EXACTLY what I was looking for when I was first starting out. I was lost for a long time, and didn't actually compile my first real hack until Kyler helped me. good guy. I got distracted by cheese. This doesn't work for LD models. It's the exact same principle though. Someone have Red's LD remake? Many of the LD arm are cut off, perhaps his problem is that there are too many missing faces? E/ Also many of the LD models only have one arm, not flat posed as well. goldsrcforever, you'll need to tell us more on exactly what problem you have, otherwise it'll be a tedious venture to be intuitive on what you're saying. Can someone do this tutorial in video form? because not many people will understand this you know. I think a video would be invaluable to newbie modders like myself, but this is still a great tutorial regardless. Well i need a video and i need one now. I am entitled to all tutorials, give me all all video tutorials by thurs. Splendid, I look forward to it. Everyone learns how to do things differently, some people learn by seeing how something is done and others learn by doing something. ok this tutorial is a good one but tell me how do i change the hands of a model wich is not with the hands in the same position with my hands. i wanted to put HEV hands on a AK-47 model from cs. http://fbx.ro/dc1kgw7eo767v15e here are my models. if someone knows how to do this please show me how. Hi Alpha, welcome to the forums. 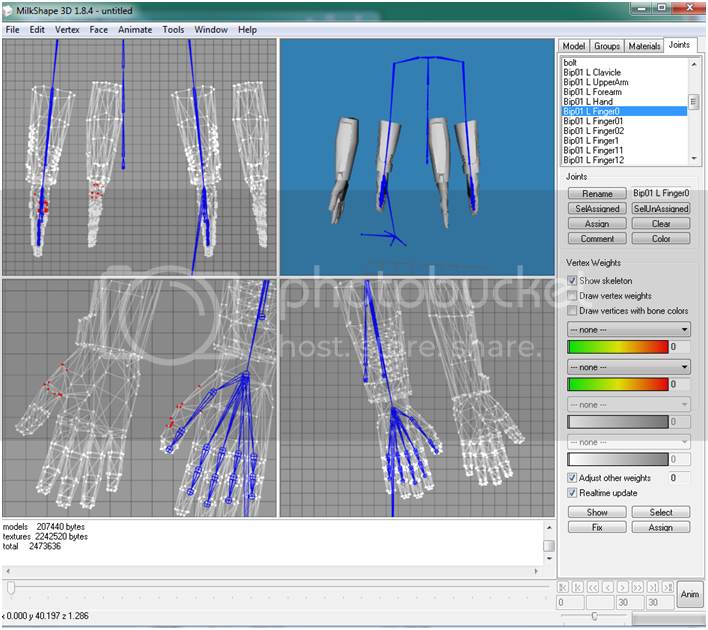 If the hands are not in the same position as the original, then you need to move and reposition the hands manually if you are using MS3D. I'm trying to think if there is a tutorial specifically on that to point you towards; I'll take a look around. ok .. understood but how.. ?